Typically when a hydraulic system is not operating optimally the most common tests performed is to check system flow and pressure. However, by only testing for proper hydraulic pressure and flow, the maintenance personnel may incorrectly diagnosis the true circumstances which created the irregular performance. While flow and pressure are key factors in determining proper hydraulic system operation, excessive heat, fluid contamination, changes in pump shaft speed, amongst other factors may all contribute to improper performance and potential system failures. By testing for these additional pa-rameters, the correct factors of non-conformity in the system can be properly identified. Every hydraulic system has an optimally running pump shaft speed where peak efficiency occurs. Variations in the pump shaft speed reduces pump and system lifetime, due to subpar running. 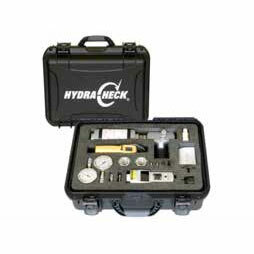 Hydracheck located in West Valley City Utah, a prominent distributor of hydraulic maintenance and test equipment, has developed preventative maintenance and diag-nostic test kits for examining the primary factors causing hydraulic system failures. One of the key instruments provided in the Hydracheck test kit is the Shimpo DT-207LR Handheld Dual Contact/Non-Contact Laser Tachometer with LED display. The DT-207LR Handheld Tachometer is the perfect tool for testing the rotational shaft speed of the hydraulic pump due to its non-contact sensing laser, which enables operators to take measurements a safe distance from the fast moving com-ponents. Hydracheck customers who utilize the hydraulic diagnostic test kits with Shimpo Laser Tachometers are able to accurately detect the actual problems in the system, reducing maintenance down time and eliminating an incorrect diagnosis which saves costs and extends pump and total system operation life.